Well, I've done it. February may be the shortest month of the annual dozen, but this year it was jam-packed. Among copious other activities, I managed to record 16 new songs and produce an album. I did this along with thousands of other artists around the world who participate on either of two web sites devoted to creating an album in Feburary, fawm.org and RPM Challenge. This is my first year doing this, and I struggled with the decision of which community to join, so I decided to join both. This blog is written in part for others who face a similar quandary, and to clarify some distinctions between the two sites. Let me be clear that I'm not recommending one over the other - just stating the facts as I see them. Both sites make it clear that this isn't a competition, so I want to respect that sentiment in this blog post. My plan here is not to reveal a clear "winner", but is simply to provide information to folks who are wondering how the sites compare. 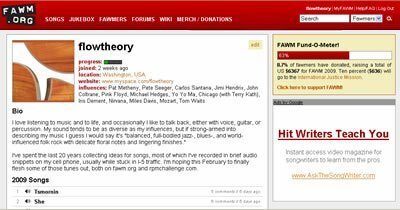 Initially I thought my participation in the two communities would result in two albums, but halfway through the month I had only recorded three songs and reality began to set in. So with only a few exceptions I posted much of the same material to both sites, and justified that by the fact that (a) there are other folks doing the same thing; and (b) a good scientific comparison demands that I control as many variables as possible. Before I plunge into comparing the two sites, readers of this blog might be especially interested in this song, which was inspired by a blind university student who came to my office and said "There's something wrong with this document". As it turned out, this was quite an understatement. Of course it's possible to create accessible PDF files. Thanks to Adobe for providing us with the means to make that happen. Unfortunately it requires some awareness on the part of document authors, which was the shortcoming in this case. When I opened the document on my own computer and asked Microsoft Mary to read it aloud, I was impressed with how confidently and dramatically she read utter nonsense. So impressed, in fact, that I went home that night and set it all to music. Check out Man With Small F on my Music site. The goal is to produce a CD, with either 10 songs or 35 minutes, whichever comes first. People post their cover art, mail their CD to RPM headquarters, and have discussions about the technical side of CD mastering and production. In late March, after all CDs have been received at headquarters, there are RPM Challenge listening parties hosting in cities throughout the United States. In 2009, there were 2229 participants. The community was incredibly responsive. 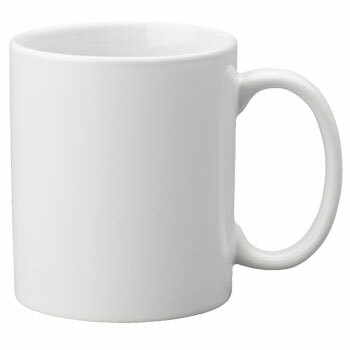 If I would post a question to a discussion board, I would take a couple sips of coffee and wait for a response, and invariably I would have at least one by then, sometimes several. 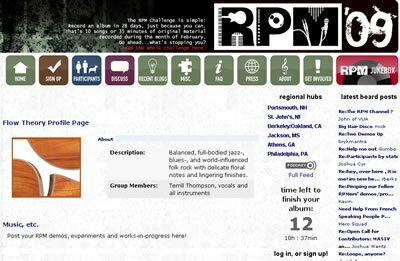 Songs are hosted by the RPM Challenge website. You upload MP3 files and they're delivered in an embedded media player on each artist's site, as well as in a central Jukebox. There's a 55 MB limit on uploads, which in the end prevented me from uploading all of my songs. Of course, I created six more songs that I needed to, so the overflow ended up being FAWM tunes, which has no limit for reasons explained in the FAWM section. Participants are identified by zip code, which is nice for getting to know other local participants. At least I imagine it would be nice. Turns out I was the only participant from Bellingham. Users communicate with each other via blogs and discussion boards. There is no way to comment on particular songs, which is a very nice feature on the FAWM site. As a result, people upload songs then write a separate blog encouraging folks to go listen to their song. This disconnect between songs and discussion is a bit awkward, but people seem to adapt. Nevertheless, I found this to be one of the things I like least about the RPM site. Musicians with disabilities take heed: The RPM interface is not at all accessible, and has in my opinion some pretty significant usability problems too. There are no "alt" attributes on images, including the main navigation buttons, which essentially renders the site completely unusable for screen reader users. If screen reader users could navigate the site, they would have difficulty navigating always valtrex online individual pages because there are no HTML headings. The site has at least eight nested tables and a distracting background image. They're using JW FLV Player as the embedded media player, which I've praised in previous blog posts for its attention to accessibility. However, JW FLV Player accessibility suffers from some inconsistencies between versions, and RPM is using a version that does not communicate especially well with screen readers. The emphasis in this community is on songwriting. You don't produce a CD - you just write 14 songs. That's four more than you have to write on RPM, but it's acceptable just to post lyrics or even a song title, without posting a recording. A few of the participants in fact were lyrics-only writers, but most actually did post complete recordings. After February, there are no formal community activities such as the listening parties promoted by RPM. Informally, a few of the artists are organizing concerts with other participants from their regions. FAWM does produce a compilation CD each year, featuring some of the best songs from that year. I'm not sure yet how the best songs are determined. In 2009, there were 2409 participants. Like on RPM, they were very responsive. Each time I posted a new song, I expected immediate feedback, and consistently received that up until the final week when everyone was madly trying to complete their own songs and had less time to listen to others'. The FAWM website does not host the MP3's. Artists are responsible for hosting them elsewhere, then providing a link to FAWM. Although they're stored off-site, the songs are played directly in an embedded player on the artist's FAWM site, so the interface is seamless. They also partner with a third party to provide free MP3 hosting for those artists who don't otherwise have access to a server. The nice thing about hosting MP3's off site is that I didn't encounter the size limitations that I encountered with RPM. As a result, I not only have 16 songs on FAWM, but one of them is my 7-minute jazz/poetry piece titled Haiku. I couldn't have squeezed that onto the RPM site without sacrificing two other songs. There is no way to identify participants by zip code on the FAWM site. The closest one can get is identifying them by state. I did find one other Bellinghamster when folks were introducing themselves in a forum. As noted in the RPM review, one of the features I like best about the FAWM site is the ability to comment directly on individual songs. Each song has its own home page, which includes the song title, a description, lyrics, the embedded player, and user comments. Songs that don't have any comments are flagged as zongs, which alerts diligent participants to listen and comment, the goal being for every song to be heard, and for artists to receive feedback on absolutely everything they produce. Accessibility of the FAWM site is currently much better than RPM. It has a clean interface and good structural markup throughout, including HTML headings and unordered lists. They use tables for layout in a couple of places, but it's mostly a CSS-based design. Like RPM, they're using the JW FLV Player, and like RPM, it unfortunately isn't the most accessible version. Screen reader users will have to figure out which button is the "Play" button, but fortunately it's a simple player so there aren't many buttons to choose from. To others: I don't recommend doing both. One thing I've really missed out on by doing this is the other half of communication: Listening. Sure, I can post songs to both sites, but it's a major challenge keeping up with what others are doing in both communities, and community is what it's really all about. I prefer the FAWM interface, especially the ability to add comments to songs; but I prefer RPM's emphasis on CD production. Ultimately it will probably come down to: Where are my friends? If you read this blog and you plan to do either of the challenges in 2010, let me know. Maybe we can do it together. I've just recently joined FAWM (2011), and posted my first FAWM song. I've not tried RPM, but, frankly the thought of producing an album in a month (A process that usually takes me two to three years) is a bit overwhelming. Thanks for the review of both!